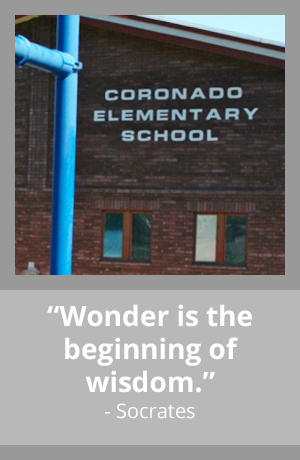 At Coronado Elementary, we serve the youngest of our community, our kindergarten through third grade students. We are proud to offer the Reading First program, which allows us to support the readers on our campus with intervention, enrichment and general education resources. Our students have regular access to a computer lab where they learn the basics of keyboarding and familiarize themselves with technology in general. Students also attend physical education and music classes regularly. We invite you to contact our staff members at the email addresses below.